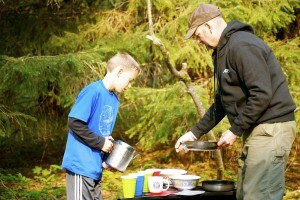 AK Dad and Kid tackle morning chores at Williwaw Campground in Portage Valley. I locked the door on the AKontheGO trailer for the last time yesterday after carting armloads of outdoor clothing, bedding, and cans of food to a winter resting place in a closet under the stairs. Bittersweet packing this first week of autumn, with yellow leaves skittering across the roof and snow falling on way-back mountain tops of the Chugach range. It was a good summer for camping in Alaska, full of new experiences, places, and people, so I really shouldn’t complain too much at packing up our 22-foot towable home. There is one positive outcome from all this cleaning, sorting, and winterizing; I can begin planning for next year. 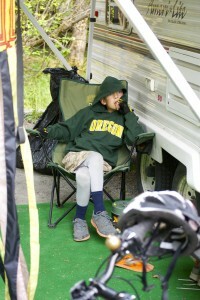 Camping; it does a family good. 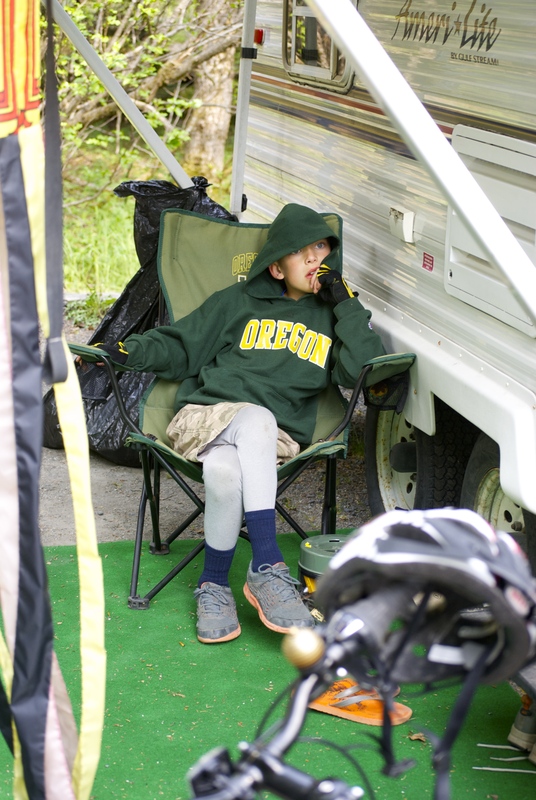 AK Kid resting comfortably before heading out for another campground exploration on his bike. 1. Plan, plan, plan. That’s three things, but you get the gist. 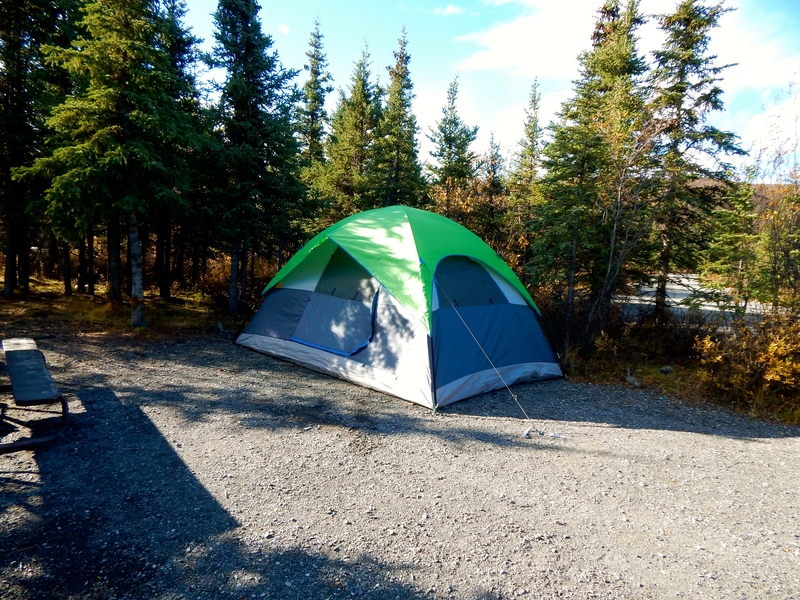 As is true with most Alaska travel experiences, camping requires careful forethought before flying north and driving hither and yon in search of a campsite. 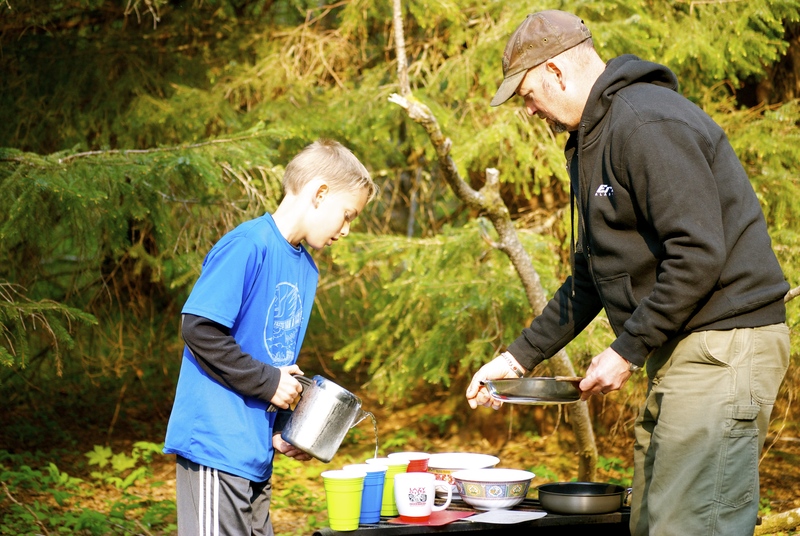 Many federally-run campgrounds contract through ReserveAmerica, a concessionaire, and this enables one to make reservations starting on January 1 of intended visit year. Alaska State Parks (DNR) also have some campgrounds with their own contractor-run facilities and reservation services. 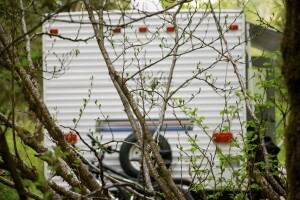 Looking for a private RV park or campground? Try RV-Camping, a website with a pretty extensive list of statewide options for private (and public) Alaska campgrounds. Great Alaskan Holidays can help with rentals, planning, and even gear! Don’t have gear? Rent an RV from a reputable company like Great Alaskan Holidays in Anchorage. 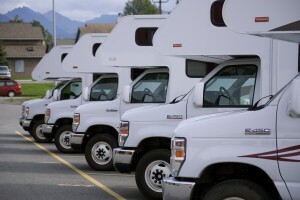 They have a variety of sizes and will help a family decide which model and itinerary fits best. The helpful staff will even pick you up at the airport or train station. Want to tent it? Try REI in Anchorage or Fairbanks for tents, stoves, and even sleeping bags. Remember this map? Each geographical section of Alaska has its own unique characteristics, and weather. Know before you go. 2. Know your geography. Never been to Alaska? 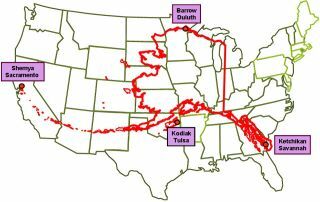 Do a bit of research HERE, and learn about Alaska’s weather, terrain, and history. It may help your family decide on which section of the nation’s largest state to visit first. 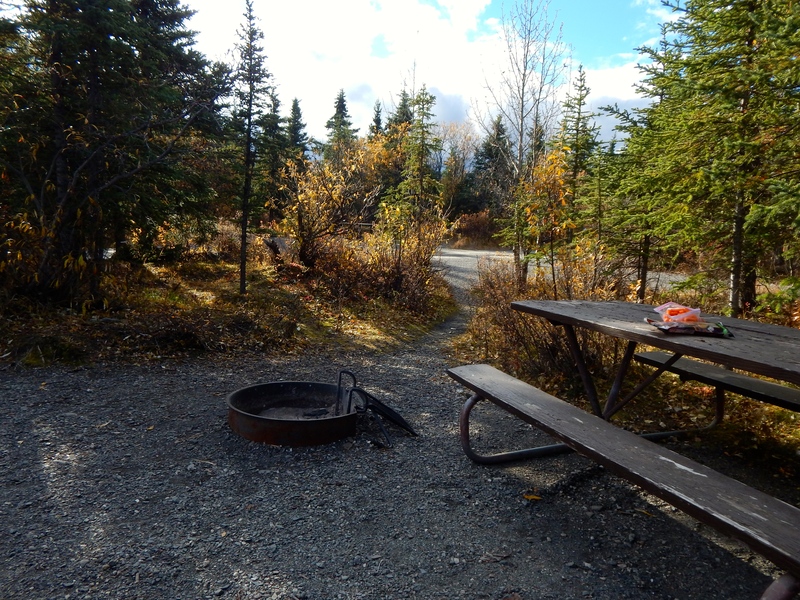 Camping in Alaska can be awfully wet, cold, and/or buggy, so know a bit about where you might be headed before you get there, and what extras you might have to bring along, like firewood, water, fuel, or clothing/bedding. Pitch a tent and stay a while, almost anywhere in Alaska. 3. Research boondock laws. What’s a ‘boondock’? 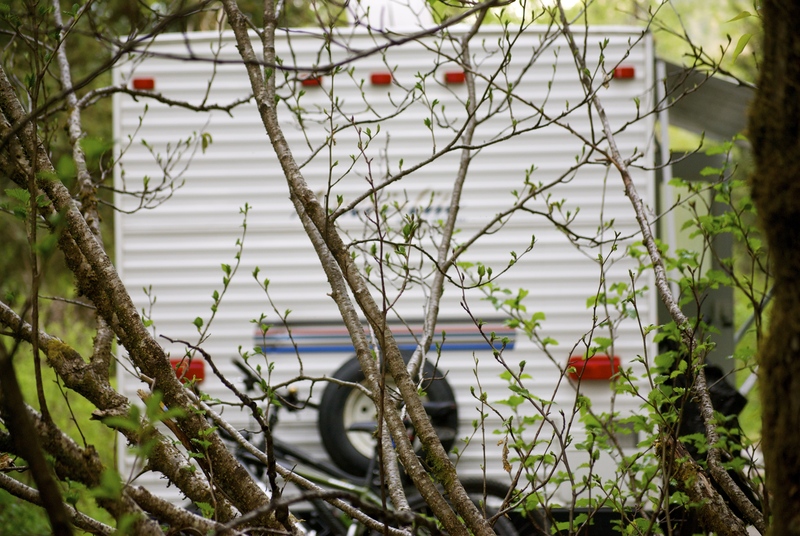 RV pros know boondocking as ‘dispersed camping’ as well, in locations on public lands with agency permission. Alaska has been famous for boondocking over the past 50+ years, but now, with so many people rocking the roadways in search of quieter, less-crowded places to camp, it’s become a bit more difficult. That said, there are still plenty of places to park or set up camp for a night or two, and federal land management agencies can help. 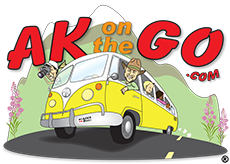 Try the Alaska Public Lands Information Centers in Anchorage, Fairbanks, Tok, or Ketchikan; they’ll have maps, directions, and rules of the “non-road” you want to travel. Many people ask us about the large number of pull-outs along major Alaska roadways, wondering if those areas allow free camping. The answer: It depends. IF no posted sign or placard is erected at that site, usually with a tent or camper sporting a bright red circle and a line across the middle, then it can usually be assumed camping is permitted. Of course, private property is always a no-no, so keep your eyes peeled. 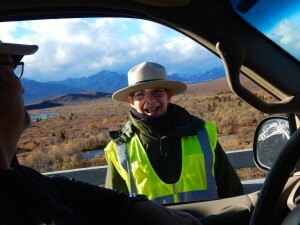 A very nice ranger checks to be sure we have everything necessary for a comfortable camping experience in Denali National Park. 4. Bring enough gear. Camping in Alaska means exposing your family to swings in weather conditions, with rain one minute and bright sunshine the next, and maybe a little snow tossed in for good measure. Even warm, sunny days can lead to chilly nights, and it would be a shame to miss out on a minute of Alaska fun because of poor clothing choices. I always bring snow pants, gloves, hats, and rubber boots for maximum enjoyment at the campsite. AK Kid even sleeps in his snowpants sometimes, finding them to be quite cozy on a cold summer or fall night. Don’t forget headlamps and plenty of batteries, too, for even the Midnight Sun goes down eventually (albeit just for a bit), and it’s fun to read books in the tent or camper! 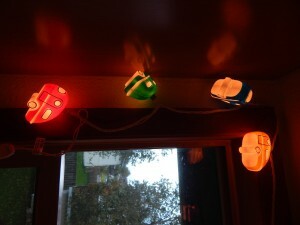 Camping - it's always on our minds these days! It may be time to think about winter, but next summer is heavy on my mind. How about you? 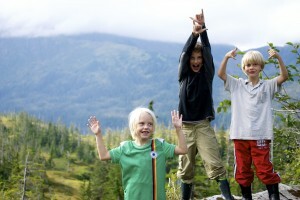 Posted in Camping and tagged Alaska, Camping, Family Travel, Great Alaskan Holidays, REI, road trips.